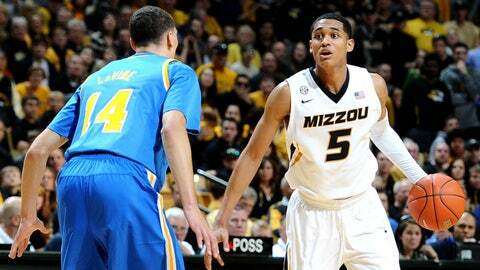 The Missouri Tigers, led by guard Jordan Clarkson, are one of nation's 15 undefeated teams remaining. Jamie Dixon embraced the idea of conflicting styles when discussing his Pittsburgh program’s move to the Atlantic Coast Conference this preseason. "Just the pure numbers, you’re going to see different ways of playing." The 2009 Naismith Coach of the Year knows his stuff. His Panthers may have sped up their tempo a bit, but they still rank among the seven slowest teams in the conference. Four of the other six teams, Syracuse, Notre Dame, Boston College and Miami, are also Big East transplants. Of course, Boston College and Miami are coincidental members of the slow-it-down club, having "adjusted" to ACC life long ago, but it’s clear the infusion of Pitt, Notre Dame and Syracuse will bring a new dynamic to the league. It’s a stark contrast to the fast-paced styles of ACC heavyweights North Carolina and Duke. But if the first month of play offers any clues, it’s a positive change of pace. The Big East transplants are a combined 24-2 this season, with Pitt and Syracuse boasting undefeated records and top-10 rankings in Ken Pomeroy’s efficiency ratings. In fact, of the 15 remaining undefeated teams, six have officially moved conferences in the past three seasons. Though conference realignment was generally driven by college football — and more specifically by money and television markets — a few conferences, the ACC specifically, have benefited on the court as well. Recent SEC additions Missouri and Texas A&M both rank in the top-100 in efficiency ratings. The re-structuring of the Big East and American conferences has set both leagues up for success for the foreseeable future, even after Louisville jumps to the ACC in 2014-15. Colorado and Utah should contend for top-half finishes in the Pac-12. 1 Bo Ryan’s comfort zone does not extend to talk of top-10 rankings and his team’s potential for postseason greatness. As much as the veteran coach may like his Wisconsin Badgers and be willing to incrementally speed up the game tempo — up to 65 possessions per game (! ), ranked 314th-fastest in the country yet still the speediest in Madison since the 2006-07 season — to account for their talents, discussing 10-0 records on conference calls is not a part of the equation. Still, speaking of that ’06-’07 team that featured the likes of National Player of the Year candidate Alando Tucker and fellow senior Kammron Taylor, comparisons are starting to fly. Lines drawn in the snow connecting the dots from one elite Bo Ryan team to another. That team ended up winning 30 games and rose to the No. 1 spot in the country before capturing a 2-seed in the Big Dance. "I still have ââ somebody gave me a copy of that We’re No. 1," Ryan said of a news clipping from that season on his teleconference this week. "That lasted a long time. Seven days." Here Ryan is referring to the wheels falling off the wagon late in the season with the Badgers losing four of their final eight games, including an unceremonious first-weekend exit to UNLV in the NCAA Tournament. Seven seasons later and the March storyline plays out in similar fashion: one or two wins followed by an earlier-than-the-seed-suggests departure, efficiency kings cast aside by lower seed in five of the past seven tournaments. If the season ended today, the Badgers would hold onto a No. 1 seed after quality wins over Florida, Saint Louis, Virginia and Marquette already. That would be a first for the program in the 64-team tourney format and it would help avoid another program bugaboo: in their 17 tourney appearances since 1980, the Badgers have been bounced by a No. 1 seed six times. Bo Ryan will not likely delve into any of this. He’s focused on the day-to-day right now. His team is efficient as ever (top-20 on both offense and defense) but he doesn’t want newspaper clippings or hype. He wants one thing. And he can only get it four months from now. Until then, rolling through a soft back end of the non-conference slate without a letdown and a top-two or -three finish in Big Ten play will only help matters. With this strength of schedule and a prospective Big Ten title, though, there’s no reason why Wisconsin shouldn’t be among the early frontrunners for a No. 1 seed. The Badgers will have to break their own mold from there. 2 A few weeks ago, while covering a Hawks-76ers game in Atlanta, word came down that Philadelphia point guard Michael Carter-Williams would not play due to a left foot injury. Many writers looked up from their plates of $5 dollar press room pizza with a similar expression: "What are we going to write about now?" The former Syracuse playmaker has taken the NBA by storm — when healthy — by averaging 17.7 points, 7.3 assists and 5.8 rebounds per game through his first month or so in the league, a threat to post a triple-double on a nightly basis. In a November Hawks-76ers game, he was supposed to be the highlight, much as he was while leading the Orange to the Final Four in Atlanta last season. He was the key cog on that Boeheim team, even while taking just 19.6 percent of available shots at an unimpressive 43.8 effective field goal percentage. Carter-Williams set the tempo offensively (assisting on four of every 10 baskets), crashed the boards and was extremely dangerous defensively at the top of the 2-3 zone. His decision to leave school early came as no surprise. His replacement isn’t half bad, though. Tyler Ennis, a true freshman from Brampton, Ontario, has turned plenty of heads through his first nine collegiate games as Syracuse’s most effective freshman point guard since Johnny Flynn. Serving more as a pure distributor in an offense stocked with talent (C.J. Fair, Jerami Grant, Trevor Cooney), he’s quickly ingratiated himself into the Orange fold. Though the overall totals aren’t quite on par with Carter-Williams’ stellar sophomore campaign, he’s taking fewer shots and producing at a higher rate on the offensive end. Much like his predecessor, the 6-foot-2 Ennis is active on the defensive boards and in the passing lanes, but he’s more careful with the basketball (nine turnovers in nine games; Carter-Williams averaged 3.5 per game in 2012-13). So what does this mean for Syracuse’s success? Well, whatever losses the team suffered defensively from last year’s stingy team, they’ve more than made up for in offensive efficiency, bumping its rate up seven points per 100 possessions (117.5, eighth nationally). Along with breakout performances from Grant and Cooney, both sophomores, Ennis is a big part of that equation. And just what does Boeheim think of his new-look backcourt? "You can’t ask them to play at a higher level than they’ve played." 3 First, a free pass: UNLV has faced some difficult matchups to tip off the post-Anthony Bennett era — not to mention the losses of Mike Moser, Anthony Marshall, Katin Reinhardt and Justin Hawkins — with three of its four losses coming to Arizona, Arizona State and Illinois. That’s not easy for a team looking to replace so much production. Still, a 21-point loss to UC Santa Barbara while not a single starter scores in double figures is a red flag. There’s simply too much talent there. Bryce Dejean-Jones, Khem Birch and Roscoe Smith would be starting for practically every team outside the top-25, and some within it. Still, despite remaining strong defensively, the Runnin’ Rebels are still trying to find their footing on offense. They rank 256th in offensive efficiency while shooting 47.6 percent (eFG), turning the ball over one out of every five possessions and clanking practically half their free throw attempts. If this is a team that is going to have to manufacture points, the easy ones need to, you know, come a little easier. Head coach Dave Rice has done a commendable job of assembling talent in the desert — although plenty have transferred upon arrival — and with another strong recruiting class coming in next season, the future looks bright. However, this roster is capable of making the tourney this season. As the freshmen grow into their roles and the upperclassmen improve (probably), this 3-4 record should look a lot better come conference play — and the Mountain West is a different story for a different day. 4 While scrolling through Bo Ryan factoids and records for Corner No. 1, I came across the oft-discussed portion of his resume: 12 seasons, one Elite Eight appearance. "Scott Drew has more Elite Eight appearances," one comment read. This struck a cord. Not because of some rush-to-the-defense of Ryan mandate, but because both are quality coaches whose best tournament runs benefit from a bit of false advertising. They actually have quite a bit in common. Under Drew, Baylor has never beaten a single-digit seed in the NCAA Tournament. How does a coach lead his team to two Elite Eight appearances in the span of three seasons without beating a single 9-seed or better? Good fortune, for one. It takes a strong regular season (to earn a single-digit seed) and upsets all around your respective regional. Ryan’s 2004-05 Elite Eight appearance followed the exact same script — three wins over double-digit seeds before falling to 1-seed UNC, the eventual national champions. Drew’s best teams were also bounced by eventual national champions (2010 Duke, 2012 Kentucky). Ryan may benefit from a head start on building up his program in this sample — as CBS writer Gary Parrish points out, with the help of Nickelback, Drew inherited a catastrophic mess — but his tournament resume, despite one fewer third weekend appearance, is a bit more impressive. Plenty of wins, plenty to prove. Join the club. Of course, this is all one long way of tying the Bears into this Corners mix, because much like Wisconsin, this may very well be Drew’s best team, too. Not most talented, but certainly comparable to the 2011-12 team, especially on the defensive end. With wins over Colorado, Dayton and Kentucky — plus a close loss to Syracuse — Baylor will be a factor in the Big 12 race. Five upperclassmen are seeing significant minutes this season, a rarity in past years, Kenny Chery has done a fine job in replacing former All-Big 12 point guard Pierre Jackson and sophomore Isaiah Austin is (somewhat surprisingly) starting to show signs of life and/or efficiency against quality competition, even though his rebounding numbers and turnover rate remain atrocious for a 7-foot-1 projected lottery pick. If the season hinged on Austin’s development alone, I’d still sell this team. However, there’s plenty to like here. The Bears are a team built for start-to-finish effectiveness on the defensive side of the ball, and that’s a foundation to build upon in March. Yes, even against single-digit seeds. This week sees the second edition of our (Way Too Early) Naismith Watch, plus a few top performers around the country who could sneak into consideration throughout the year. This early in the season, this list could be re-ordered any which way and be defended intelligently. More players — Casey Prather, Keith Appling, Russ Smith, Joseph Young, Jordan Adams, Roberto Nelson, Cleanthony Early, to name a few — could be added without much argument. It’s still early. If you want to argue the merits of Parker’s and Randle’s consistency against the highs and lows (one game) of McDermott, go for it. Napier’s overall numbers are not as impressive as some others because he’s gone into cruise control against lesser competition. Should he be downgraded for that? Personal opinion: No. Production against top competition should be weighted more heavily, rather than looking at season averages in a vacuum. But at this point, every one of these candidates has held up well against at least one ranked team. There are no absolutes in December. If Marcus Smart, when healthy, is the best player in the nation so far, then that will more than likely play out over the next few months. As for now, Parker holds the top spot for one more week, but he has some work to do after so-so performances against Arizona and Michigan. Jahii Carson, Arizona State: It’s been a difficult couple of weeks for Arizona State sports. Not only did the basketball and football teams combined for three losses in a 10-day stretch, but newspapers can’t even get the Sun Devils’ logo right. It’s been an up-and-down stretch for Carson, too, the All-American-caliber point guard who is at the controls of Herb Sendek’s offense. Long story short: When Carson does not play well, the Sun Devils do not win. He’s in that Shabazz Napier ballpark where he has talented teammates (Jordan Bachynski, Jermaine Marshall) but his team relies on him so, so much. Only seven other major conference players use a greater percentage of their team’s possessions while on the court. Carson has posted two games this season with an offensive rating of 90 or lower — the Sun Devils lost both games. If Mizzou is going to compete for the SEC title, they’ll need that big backcourt to continue producing at a high level, especially as Kentucky’s young team gains experience and Florida gets healthy. Khyle Marshall, Butler: The loss of Roosevelt Jones back in August threw an early wrench into first-year head coach Brandon Miller’s plans, but the emergence of Khyle Marshall as a potential go-to threat has been vital in the Bulldogs’ strong start. The 6-foot-6 Davie, Fla., native played a little more than 20 minutes per game in his sophomore and junior seasons, serving as a second or third option in Brad Stevens’ offense. Now it’s his turn. The senior’s playing time has increased to 30 minutes per game and he’s responded in kind: nearly doubling his scoring (17.4) and rebounding (7.1) averages. Though he did not play particularly well in close losses to Oklahoma State and LSU, his ability to take on 30.6 percent of the team’s available shots in an efficient manner has helped Miller hit the ground running. UMass: At 8-0, the Minutemen are off to their best start since the John Calipari era (1995), the season they rose to No. 1 in the country by beating top-ranked Kentucky and Tim Duncan’s Wake Forest team. UMass would go on to win its fifth straight Atlantic-10 title and earn a No. 1 seed in the NCAA Tournament that season. "I call it our glory days," former Minutemen player George "Trigger" Burke says in a documentary commemorating the program’s 100th season. And he’s right. The 2013-14 team does not have a young Marcus Camby or Calipari roaming the sidelines, but the combo of Chaz Williams (120.2 ORtg) and Cady LaLanne (121.7 ORtg) is doing just fine and a Calipari disciple is leading the way. Derek Kellogg, a former UMass guard, graduated the season before the 1995-96 regular season run, but he’s getting a taste this time around. Similar to — though not a mirror image of — that 1995 start, the road has not been paved with cupcakes: wins against LSU, New Mexico, Clemson and BYU will count for something down the road. The Minutemen are playing faster than they ever have under Kellogg, scoring 1.13 points per possession and punishing opponents on the offense glass. Glory, glory. Colgate: The Raiders are going to take home this season’s Patriot League title by raining down 3-pointers â¦ or go down trying. Head coach Matt Langel, a former Fran Dunphy player and assistant while Dunphy’s Penn and Temple teams were taking quite a high percentage of outside shots, has flipped the script on the strategy former headman Emmett Davis employed in his final seasons in Hamilton. Langel’s team shoots 3s — and plenty of them, this season more than ever before. Armed with a plethora of shooters and just two players logging significant minutes standing 6-foot-8 or taller, the Raiders simply let it fly. The result: a 4-3 record. However, Colgate hung around with Wake Forest, kept the final margin against Syracuse under 20 points and lost by just six points to Georgetown. Those are their three losses. Even worse news for Patriot League competition: the Raiders are making a substantial amount of these 3-pointers. Colgate boasts the highest 3-point percentage (47) in the nation thus far despite taking outside shots at a higher percentage than every team except Princeton and Eastern Kentucky. Almost by default, this gives Langel’s team the highest effective field goal rate in the country as well — one of the key components of overall team success in any given game. Through the first month-plus of the season, Bucknell appears to be the class of the Patriot League — for what it’s worth, the Bison make 43.4 percent of their 3-pointers — but very few teams want to get into a long-range shooting competition with Colgate. It’s going to make or break its season. Boise State: The Broncos make their (seemingly weekly) appearance in 4 Corners with plenty on the line. Facing a road game against the Kentucky Wildcats — and superstar freshman Julius Randle — they are set to be tested for one of the select few times during this non-conference slate. The strength of schedule has been downright lousy for Leon Rice’s undefeated Broncos, ranked 344th by KenPom with just one quality win coming by a two-point margin against Utah, and the trip to Rupp Arena will be one of the few performances outside of the Mountain West they will be judged upon if they are searching for an at-large bid come March. This is a talented, experienced team. No question. Will it be enough against all that NBA-caliber talent, though? Guards Antony Drmic and Derrick Marks should find some semblance of success against the youthful Wildcats, who ranked 50th in defensive efficiency entering Monday’s games and have struggled to defend perimeter players in games against Baylor, Providence and Cleveland State. There should be some points scored here. The real question: Just how good can Boise be on the defensive end against one of the nation’s most efficient offensive machines? Can it defend the likes of Randle and Willie Cauley-Stein on the interior? The work Broncos big man Ryan Watkins puts in on the boards (23.7 OR%/27.7 DR%) will certainly play a role. The game catches Kentucky in the middle of its most difficult stretch of the season — Baylor, Boise State, UNC, Belmont and Louisville in succession — so the door is open, if only by the slimmest of margins. Cornell: Success has yet to follow Steve Donahue to Boston College — 28-45 record as an ACC coach — but it certainly packed its suitcases when he left Cornell. Following three straight 20-win seasons and conference titles at the Ivy League school, Donahue followed protocol and took a bigger job. His successor, Bill Courtney, has been unable to keep the ball rolling, finishing with a 35-52 record in his first three seasons. The Big Red are 0-10 this season and feature the worst defense in the country (120.4 points per 100 possessions). Ivy League bragging rights have shifted and one has to wonder if Courtney is the one to reclaim the title.